Zimbabwe did not pay a single cent for President Mnangagwa’s recent visit to the United Arab Emirates as the trip was fully funded by his host, it has emerged. Further, Zimbabwe will continue with its engagement and re-engagement policy with other countries in the global community of nations. This was said by President Mnangagwa while officially opening the 111 ordinary session of the Zanu-PF Central Committee in Harare yesterday. “…I was in Abu Dhabi where I was invited by the Crown Prince of Abu Dhabi,” said the President. “They (his hosts) looked after us well then we hear some saying we have hired a plane for that visit. Forget about that. They sent us their plane. We never paid anything as Zimbabwe. The Crown Prince sent us a huge plane to carry us and it returned us (home). I told him that we have a challenge of planes so every time I want to travel I will just call and he will send us the plane. So those who don’t know were just parroting what they don’t know and I just laughed it off,” said President Mnangagwa. Speaking on re-engagement in light of the recent Cyclone Idai, President Mnangagwa said: “In the period under review, we continue with the engagement and re-engagement policy. As a result, we have witnessed concrete investment commitments from across the world. This will cumulatively have a positive impact on our overall economic growth and the creation of jobs for our people. “It is a result of these engagement and reengagement efforts that we receive overwhelming support from countries such as United Arab Emirates which I visited earlier this month as well as Tanzania, Botswana, Namibia, South Africa and many other countries that have supported us. It is because that we have engaged them. So it is critical that engagement should continue. You can hear some people saying why is the President travelling? If we had not been travelling engaging these countries were we going to get all the medicines that we have received? No. “It is because we have elevated our relations with other countries. Ticharamba tichidero tichisimudzira ukama vanotaura vachingotaura tichingoenda mberi kuvaka nyika neukama. (The engagement and re-engagement process will continue and critics will criticise but we will continue working to develop the country). “We are permanently and continuously shaking off the isolationist approach in the manner we do things as a result of past history which was necessary because we have been faced by the choice of do we proceed with our land reform programme to avoid isolationism or we proceed with the land reform programme whatever the world chooses to do. President Mnangagwa urged senior party members to respect the people that they lead. He said leaders should not be feared by the people they lead. 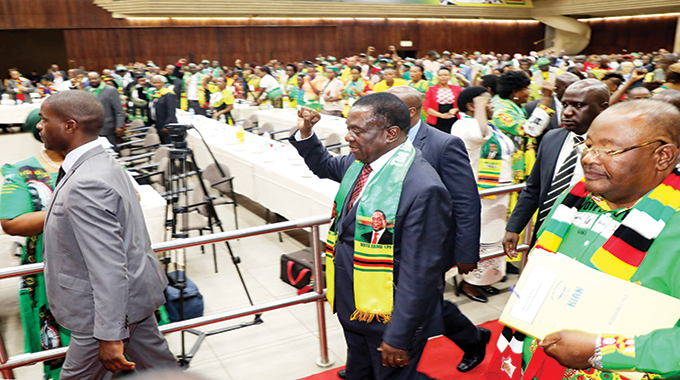 The President assured the nation that the violent disturbances that rocked the country in January at the instigation of the MDC-Alliance would not be repeated again. He also said Zanu-PF was a mass party but those who join it should be prepared to do things the Zanu-PF way.